"It became obvious at that moment, and is crystal clear now, that Hall's primary focus is no longer on winning, but coming away from his performances with some feeling of spiritual euphoria. As long as that happens, all is well in his world. When Hall contends, as he did in his most recent blog, that he has decided to walk away from a proven coach and a highly successful training group, 'with full faith that it will allow me to take my running performances to the next level,' that next level he speaks of is not on the awards podium. He is speaking in existential terms." - Universalsports.com's Joe Battaglia ripping Ryan Hall in a column entitled "Hall's solo flight leading him nowhere." Jordan Hasay's Mt. Sac freshman record goes down... watch out for Sarah Baxter of Simi Valley! I am 31 and have about $32k in my retirement accounts. Is this well below average? *Brendan Foster Compares Steph Twell's 10-Mile Debut To Paula Radcliffe's Road Debut In 2000 The comparison may seem ludicrous at first glance but it's not totally out there. In 2000, when she made her road debut, Radcliffe's 5,000 PR was 14:43 at the time - Twell's is 14:54 but Twell is 21 and Radcliffe was 26. Results Of Kenyan XC Race 2:29 marathon runner Magdeline Chemjor, who will run in NYC, was 2nd. Ryan Hall Leaves Terrence Mahon & Mammoth Track Club The world's third fastest non-African-born athlete in history hasn't come close to the form that saw him run 2:06:17 in 2008 and is looking for a change in coaches. Hall hasn't spoken yet but his agent told the New York Times, "A change of location may be good for his career. Sometimes runners need a little change in scenery. There's not any ill-feeling with the club or the coach." More in our training forum. 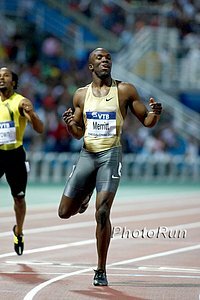 Phil Hersh: Merritt Faces Confederacy Of Dunces: "He can run in the 2012 U.S. Olympic Track and Field Trials but not in the 2012 Olympics. It's an impossibly absurd situation that owes to the confusing and conflicting welter of rules and jurisdictions in the fight against sports doping." Coe Has No Problems With Banning Merritt From 2012 Meanwhile, banned Brit C. Ohuruohu is the 2008 400 Champ. Russia Promises "Zero-Tolerance" In Buildup To 2014 Winter Games Given their track record, the promise is almost laughable. NY Times Explores How Can Runners Learn To Age Gracefully It's hard for some warriors to realize a day off actually might do you some good. Seb Coe: "It Is Illegal To Sell An Olympic Ticket And We Will Enforce This Rigorously"
*London 2012 Official Hedging On Promise To Pay For All Athletes And Officials Airfare Now they'll only pay a certain amount, which apparently is going to screw the poor countries. *One Year Removed From 13-Year NFL Career, Amani Toomer Is Running A good article and Toomer is hoping to go sub-4:00.